Giuseppe Martucci, pianist, conductor and choirmaster was Director of the Liceo Musicale in Bologna, the birthplace of Respighi. He was one of the most important Italian musical figures in the period straddling the 19th and 20th centuries. Eschewing opera, he concentrated on symphonic music championing Northern European works, especially those of a Wagnerian persuasion. As a composer his influences can be seen to have been, Beethoven, Schumann and Brahms as well as Wagner. The late lamented ASV record label released a number of his important compositions and they are well worth seeking out: the two Symphonies and the two Concertos for Piano and Orchestra and the meltingly beautiful La Canzone dei Ricordi (The song that Memories Sing). 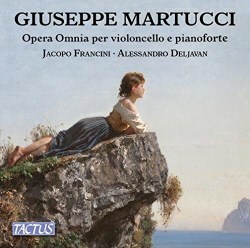 This new album of the complete works for cello and piano is a welcome addition to the Martucci catalogue. The op. 52 Sonata is an attractive and most accessible work. There is evidence of Brahms’ influence and to a lesser extent, of Beethoven. The opening Allegro giusto movement is lyrical and melodic, the Scherzo (allegro molto – Trio) hops and bounces along merrily, enclosing the rather ruminative and introspective Trio. The Intermezzo (Andante flebile) is a melancholy interlude suggesting ‘what might have been’ in a general mood of regret. The ear is seduced by the particularly enticing piano part. The Finale is extrovert and high-spirited. The two Romances, according to the writer of the album’s notes, Jacopo Francini, who is also the cellist on this recording, could have been inspired by … "the second movement of Mozart’s D minor Piano Concerto, K466,. Beethoven’s two Romances for violin and orchestra and Mendelssohn’s Songs Without Words piano Romance." Whatever … these two little gems are delightfully wistful, passive and delectably feminine, the second also suggesting prayer-like supplication. Finally, the not inconsiderable Three Pieces for Violin and Piano is a mature work and one that Francini considers to be a masterpiece worthy to be included in the accepted repertoire for the genre. Its structure, technique and rhythmic patterns are complex, especially for the piano. The effect sometimes gives the impression of larger forces at work – in fact Martucci arranged the second piece – dark and brooding, questioning and probing - for cello and orchestra. This time the influence is Wagner especially Tristan und Isolde. I felt I could detect something of César Franck too. Jacopo Francini and Alessandro Deljavan clearly empathise with this sunny music and deliver most convincing and richly toned readings all captured in warm 24-bit digital sound. Will certainly appeal to admirers of non-operatic 19th/20th century Italian music.